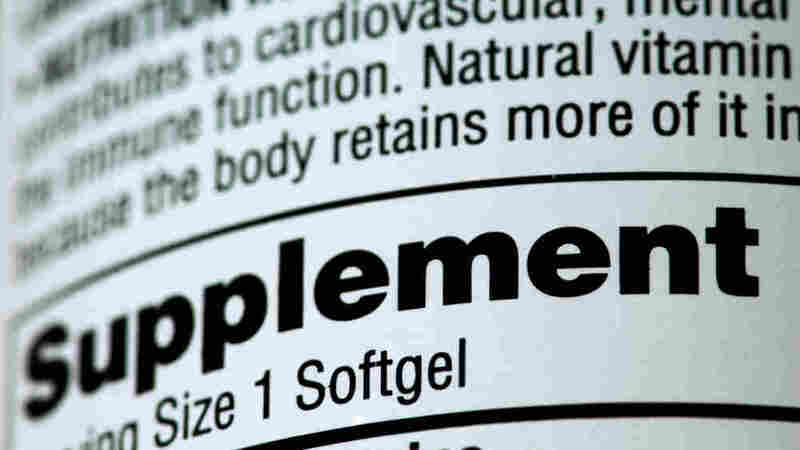 Distrust Of Supplement Ads Runs High : Shots - Health News Nearly one-third of people say health claims in ads for nutritional supplements can't be trusted. Only about 4 percent find them to be very trustworthy. When you come across an ad for an all-natural supplement that's supposed to enhance your health, do you buy the claims? Most people don't, according to a nationwide survey of more than 3,000 people conducted for Shots by Thomson Reuters, but a whole lot of them buy the products anyway. A little less than two-thirds of people surveyed in the first half of June said they'd seen, heard or received some sort of advertisement for a dietary or nutritional supplement. That's on par with responses about prescription drug ads, which we took a look at in this post. But most people who've been exposed to supplement ads are pretty darned skeptical of their claims. Some of the claims are just not true, and possibly hazardous to your health, as a GAO investigation recently revealed. Only 4 percent rate the ads as very trustworthy, compared with 32 percent who say they are not at all trustworthy. Skepticism about the ads rises with income and level of education. Even so, the proportion of all respondents who said an ad had motivated them to buy a supplement was substantial — nearly 12 percent. For prescription drugs, by comparison, only 8 percent of people asked their doctor for a drug because of an ad. Of those, only about a third received a precription for the medicine they wanted, or a net of about 3 percent of those who said they'd been exposed to a drug ad in the past six months. The margin for error in the Thomson Reuters survey is plus or minus 1.8 percent. You can see the questions and detailed results here.